Looking to rent the best Stand-On 26” electric floor scrubber in Rochester, Ithaca and Upstate NY? 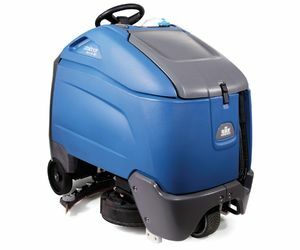 The Duke Company rents the exceptional 26 Inch Stand-On Commercial Floor Scrubber; the Windsor Karcher – Chariot 3 iScrub 26. The 26” stand-on electric floor scrubber is engineered for fast operation to maximize floor coverage. Your crew will increase productivity by 50% vs. conventional 20 inch walk-behind scrubbers. Patented water & solution economizer technology that results in substantial water and chemical consumption. Quieter, less-intrusive ‘Eco’ mode for day cleaning. 66 dBA in EcoMode. High productivity: 27,639 square feet / hour. Stand-on design for 360 degree visibility and maneuverability.